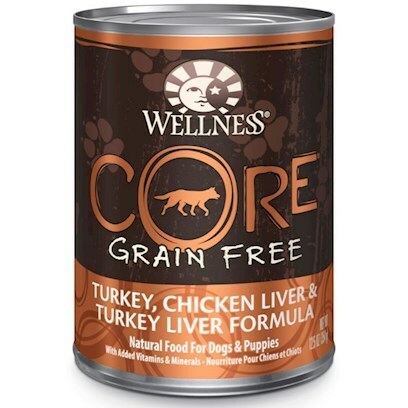 Wellness CORE Natural Food for Dogs with added vitamins and minerals is protein-focused, grain-free canned dog food. Your dog's tail will wag, and mouth will water for the turkey, chicken liver and turkey liver formula. The protein and nutrient-rich, high-quality meat, with no grains, is what makes Wellness CORE Natural Food for Dogs truly a more thoughtful and healthy choice. Serve at room temperature. Cover and refrigerate the unused portion. The amount of food your dog requires depends on age, activity level, breed and environment. When fed alone to adults, feed 1/2 can per 8 lbs. of body weight per day, for puppies up to twice this amount, and for mothers up to three times this amount. For combination dry and canned feeding, reduce dry by 1/3 cup for every 1/2 can of wet food.